As a response to real or imagined subordination, popular culture reflects the everyday experience of ordinary people and has the capacity to subvert the hegemonic order. Drawing on central theoretical approaches in the field of critical disability studies, this book examines disability across a number of internationally recognised texts and objects from popular culture, including film, television, magazines and advertising campaigns, children’s toys, music videos, sport and online spaces, to attend to the social and cultural construction of disability. 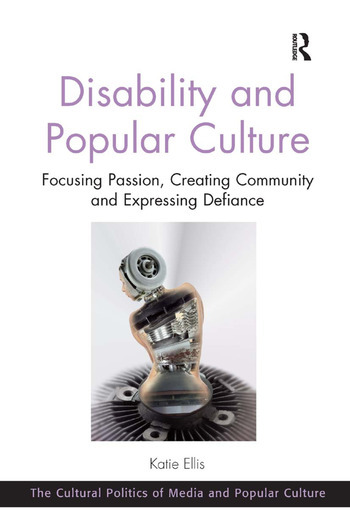 While acknowledging that disability features in popular culture in ways that reinforce stereotypes and stigmatise, Disability and Popular Culture celebrates and complicates the increasing visibility of disability in popular culture, showing how popular culture can focus passion, create community and express defiance in the context of disability and social change. Covering a broad range of concerns that lie at the intersection of disability and cultural studies, including media representation, identity, the beauty myth, aesthetics, ableism, new media and sport, this book will appeal to scholars and students interested in the critical analysis of popular culture, across disciplines such as disability studies, sociology and cultural and media studies. Katie Ellis is Senior Research Fellow in the Department of Internet Studies at Curtin University, Australia. She has published widely on disability and media, and is the author of Disabling Diversity, and co-author of Disability and New Media, Disability and the Media and Disability, Obesity and Ageing.